We create mobile-friendly dashboards for people who need it. Assetwolf: the cloud-based IoT platform for facilities management. By creating personalised dashboards, we deliver exactly the information to people on the ground, when they need it. Operators, maintainers, engineers: they can see at a glance the status of an industrial process or a facility, and they are alerted instantly to problems. Our systems monitor assets for alarm conditions. Such conditions can detect situations across multiple assets, or consider an asset's history, before enacting a procedure to handle the problem. Imagine a system which can predict when consumables will be exhausted, or which re-orders consumables at the right time. The latest Assetwolf software includes Phi, an easy-to-learn language for performing calculations on incoming data from devices. 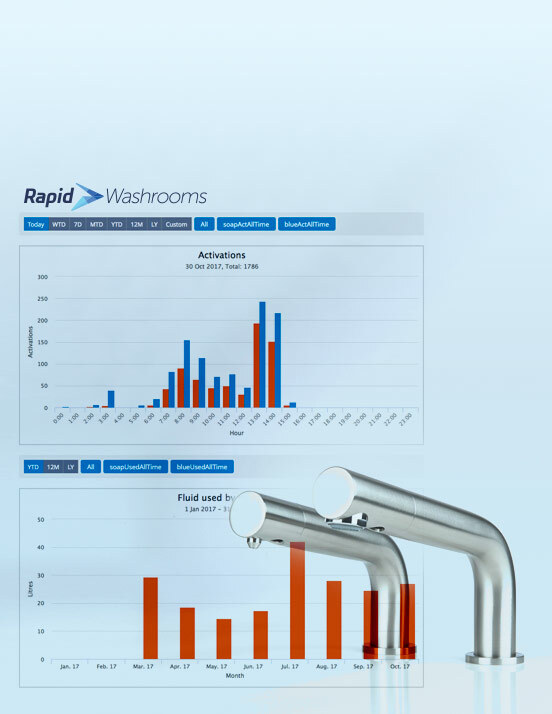 How washroom quality is rising and costs are falling in facilities management. Connect any thing to Assetwolf. It accepts industry-standard MQTT and REST connections over wi-fi, internet and cellular. Share the data with your customers through your branded, mobile-friendly interface. Assetwolf supports user accounts, as well can group them by customer and physical location. Make superuser accounts, create a maintenance team, and anyone else you like. Configure alarms when pre-determined conditions arise, so that the right people can deal with a problem when it arises. You can even embed Assetwolf in an existing website.